written specifically for our development board HCDVBD0032. DAMAGES FOR ANY REASON WHATSOEVER. We recommend installing the Cosmos C compiler before installing the STVD development environment. Regsvr32 /u "C:\Program Files (x86)\Common Files\Microsoft Shared\DAO\DAO350.DLL"
Regsvr32 "C:\Program Files (x86)\Common Files\Microsoft Shared\DAO\DAO350.DLL"
With a RaspberryPi 3 (Now works on a PI Zero W) I have had some success reading the flash and eeprom. //Always ensure that you do not trash your source file as reading will over-write it. ie. keep backups out of the current directory. MINDEV is the miniature development system. //This writes -w the stm8S with the Forth OS. //Now pull the stlinkv2 programmer and disconnect. //eForth is now operational! from a RaspberyPi3 or Pi Zero W, using mini-USB as 5 volt power and an HC UART dongle for communications; PD5 Green PC-RXD, PD6 White PC-TXD, Black ground of course. Red +5 v is left unconnected for now until I confirm VDD pinouts. screen or picocom are USB terminals. dmesg to see which USB port is active after plugging dongle in. always use <enter> after the dot. The WORD square is volatile in RAM. COLD re-initializes the sysytem, stops running background tasks, and clears any words in Ram. RESET erases all added words in flash and RAM. - switch back to run mode. This code will survive a power cycle as it is now burned into flash. See that your added words survive a COLD restart. The core functionality of eForth began with 31 primitive words. The rest were compiled with the : - - - ; constructs. 8080 CC 80 A0 AE 0 0 27 7 72 4F 0 0 5A 26 F9 AE L_ .__'_rO__Z&y. Don't like the lack of leading zeroes, then change it! Call it : takeAdump ... ; getting there! FILE and HAND switch in and out of interactive mode and handle file transfers better? - yes by turning off local echo including error msg. I think that this is a way to run PWM in the background. Multitasking is not a feature but a simple hardware background task is. Rosetta spacecraft and Philae lander were launched in 2004 and arrived at Comet 67/P 10 years later. Both had significant instrumentation running on Forth. This alone is reason enough to abandon Windows / Mac and get with the 70's. My dislike (hatred is more accurate) of Windows should not deter anyone from using the HC links and ST Microelectronics IDE and software, third-party tools, even HyperTerm or Putty. Putting an Airbus A380 cockpit on the back of a mosquito and saying how much you like flying is only meant to get more people back from the Dark Side. By all means, buy a board and interface and programmer from HC and learn Forth. There are now many active eForth / STM8S parallel threads using different boards with supplemental information. Check for content from May 2017. Last edited by barewires on Fri Jun 16, 2017 8:43 am, edited 28 times in total. Thanks, I've now corrected the error in the title. Barewires, that looks cool! So SDDC and STM8FLASH actually run on a RaspPi? This means that people with a Windows PC should have no problems using the embedded STM8 Forth on the github site (just use a RasPi)! Thinking about it, boards like the HCDVBD0034 are a good choice for RaspPi I/O expansion, or as a system watchdog. Compared with an Arduino IDE the Forth is a featherweight - no need to run edit-compile-flash loops Building an interfacing between the STM8 and the RaspPi through SPI or I2C should also be possible. I do most of my development (well everything now) on a Pi 3 and the old / new - Pi Zero / Pi Zero W . I don't use Windows much as I need a reliable and consistent environment which sadly has never happened with MS. I have lost too much time and effort, since the 1985 Windows 1.0, watching that soothing Blue Screen of Death. Feb 3, 1976 http://www.lettersofnote.com/2009/10/mo ... tware.html Bill Gates tried to take the moral high-ground after stealing time on a military-owned DEC PDP-10 system at Harvard and stole / disassembled / modified the Digital Equipment Corporation BASIC IP software contained on the university system to launch his company for personal gain. Even worse was his friend Paul Allen was not registered there and was accessing the computer. Bad, as Trump would say. https://www.xkcd.com/378/ or https://www.explainxkcd.com/wiki/index. ... rogrammers if you don't understand it. Real programmers, in my day, didn't have keyboards or monitors. Computers then 12 bit, 4K core, the price of a new house or two were incapable of making a mistake and then along came HAL 9000 and Mr. Bill. There just is not enough time left to start learning a new IDE having wasted much time on Microchip MPLAB over the years. I loved PICs since the 90s and even GCB recommended by HC is a cool free compiler. Using a PIC means buying programmers / development kits, which the ones from HC are perfect. The ease of eForth on an STM8S as a self-contained OS, interpreter, compiler, debugger for a few £ and makes everything else obsolete. There are Windows options; SDCC, PUTTY, TeraTerm communications works with my eForth STM8S. I am sure that there are tools to do it but I am not going there. Anything is possible with these parts. FORTH actually began in the late 60s and there are only a few languages that survive today. FORTRAN still is used in science, BASIC had a bad rap but is now a real high-level language (GCB Great Cow BASIC.) Arduino, I have a dozen, never rang my chimes, as I felt the edit-compile-flash-test loop was a step back to the 70s when UV erasing and burning EPROMS was the task if one couldn't afford a $25,000 Intel Development System. Needing a variable frequency beeper, I found this works perfectly as a built-in hardware feature on the STM8S series. \ ' annoyA0 BG ! \ ' annoy BG !
' annoy BG ! sweeps the BEEP pin Port D4 from 32.24 KHz down to around 2 KHz and loops over 21 seconds. Frequencies will vary slightly between devices. BG is a background task. silence doesn't but hangs at constant 3.39 kHz = 17 beep, so it needs fixing. 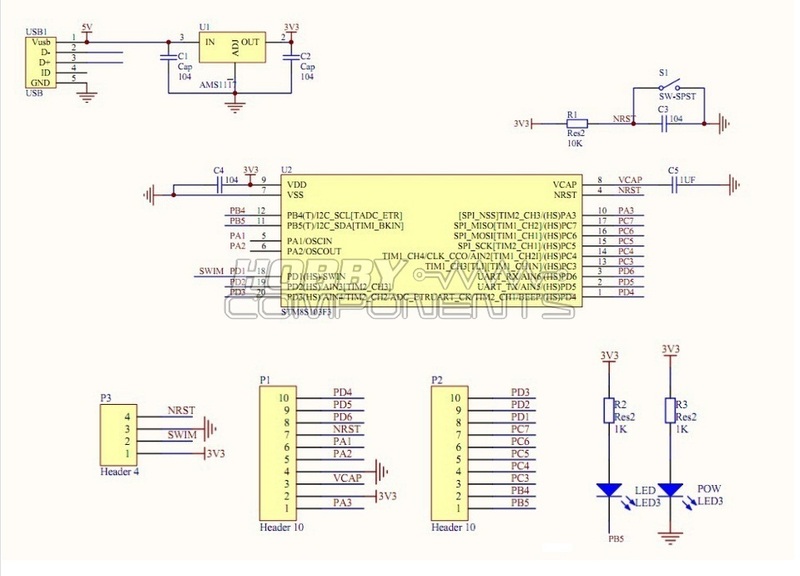 The beep control status register is $50F3 and takes a range from 0 to $1e and is reset to $1f on powerup or reset press. en.CD00190271.pdf is the factory manual. Simultaneous LED blinking and fixed (non sweeping) frequency beeping is possible. Last edited by barewires on Sat Jul 08, 2017 3:13 am, edited 7 times in total. I don't have a beeper connected to my board, so no test. Last edited by barewires on Sat Jul 08, 2017 1:39 pm, edited 1 time in total. Frequency generation with the Buzzer output is very limited. Playing a tune wouldn't sound 'nice'. 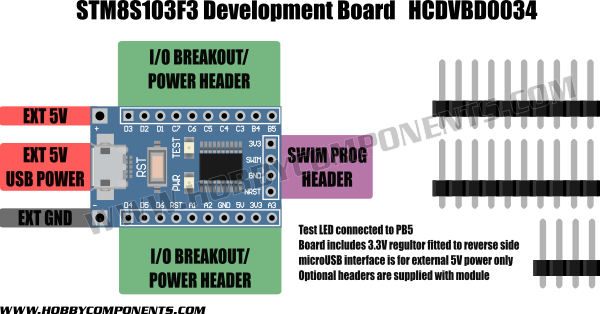 There is an example for Timer1 and PWM usage on HackaDay here. The SFR addresses can be found here. It wouldn't be difficult to control a servo with it. I turned the example into a frequency generator. EDIT2: I figured out how to use the TIMER1 prescaler. The lowest frequency is 16 Hz. By the way, "e4thcom" now has an STM8EF plug-in. It works great! Cool! Now I have simultaneous constant beeping on PD4, PWM on PC3 and low freq flashing LED on board and PB5. Looks like I need a 3 chan scope (sic) or a working HC logic analyzer. Last edited by barewires on Thu Sep 07, 2017 4:18 pm, edited 1 time in total.